Despite all the prevailing corruption and deteriorating law and order situation in the country, there are some wonderful initiatives taken by the Indian Government which has made us proud of our country. 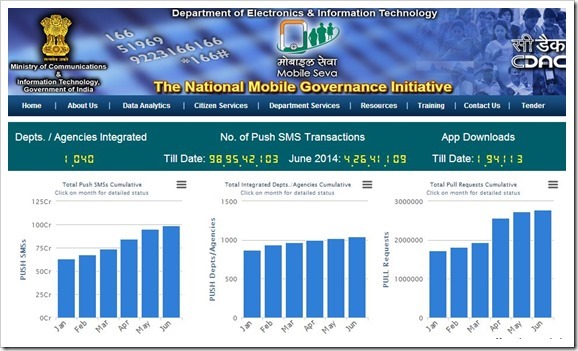 Indian Govt’s mobile governance initiative: Mobile Seva is one of them. Mobile Seva is an e-governance initiative conceptualized by Department of Electronics and Information Technology and launched in December 2013. It is a platform to provide public services to Indian citizens via mobiles and tablets. Using Mobile Seva, government has integrated different initiatives of e-Governance such as State Data Centers (SDCs), State Wide Area Networks (SWANs), State and National Service Delivery Gateways (SSDGs/NSDG) into one common channel. At the end of May, 2014, more than 1000 government bodies across different departments have integrated their services via Mobile Seva. Citizens can use text messages, Interactive Voice Response System and mobile apps to access any public service offered by the government. As per the official stats, as of May, 2014, Mobile Seva had sent 989 million text messages to various people, thereby proving it’s worth. Mobile Seva uses the immense reach of mobiles across rural India so that people from all walks of life can use this system to get the desired information and guidance it seeks. As of now, there are around 300 mobile apps which can be downloaded into a smartphone and used as per the requirements. This includes apps for Right to Information, India Post, Voter Information, Passport, Care for Mother, Health Apps and more. 41 million push messages were sent across India in the month of June alone. During the ongoing “2014 United Nations Public Service Day Awards Ceremony & Forum” which is happening in Seoul, South Korea, Indian Government was awarded 2nd prize under the category: “Promoting Whole of Government Approaches in the Information Age”. Infact, as per the official press release from the Indian Government, this is the only award which India received during the event. India shared this award along with Bahrain, Brazil, Cameroon, Republic of Korea and Spain. Here is a list of all the awards presented by the UN, covering different areas of public service by different countries. sir mujhe m-governance ka android mobile ka software mere e-mail par bhej dena.